Your marketing tools describe who you are and are essential for your veterinary hospital's identity. Each tool tells its own story; however, they must all work together to form your hospital's identity. Since most new clients don’t know anything about your veterinary hospital, your marketing tools need to educate them about your hospital and establish a bond and trust. Your Veterinary Hospital Logo - Your logo conveys your veterinary hospital's identity and builds name recognition. Your Website - Your website is the Swiss army knife of your veterinary hospital's marketing toolbox. It is a multi-purpose tool and is seen everywhere and by everyone. Your Veterinary Hospital Brochure - Your brochure tells clients and visitors who you are and what you can do for them. It should be distributed to retail shops and at all local events and functions. 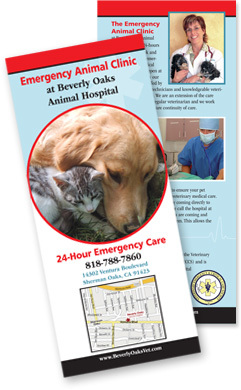 Along with a website and logo, a brochure is a must-have marketing tool for your veterinary hospital. Even in today's technology-driven world, don't underestimate the value of a colorful, interesting and professionally-designed brochure for attracting new clients. Your veterinary brochure can have a profound impact on potential clients, but only if it's done properly. Combining professional photos, compelling text and an excellent design are all necessary for a successful veterinary hospital brochure. The experienced design team at VetNetwork knows how to combine all the essential elements to create an effective and professional-looking brochure for your veterinary hospital that brings pet owners right to your door. 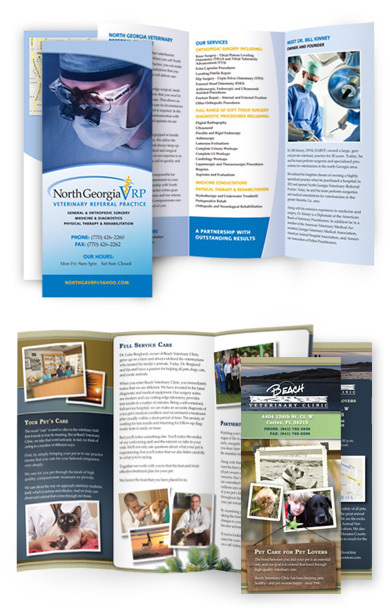 A well-designed veterinary hospital brochure communicates your core values and key benefits. It reinforces the message you are sending to potential clients in a simple, direct format that can be distributed easily. VetNetwork will create your brochure so it effectively piques curiosity and leads prospective clients to ask you for more information, view your veterinary hospital's website, or call for an appointment. If you have invested in a new technology or service, a well designed brochure is a great way to introduce it to clients and prospective clients. View our portfolio of veterinary marketing brochures. Flyers are an inexpensive and easy way for you to communicate and market your services to all pet owners. Hospital events, promotional items, and new services can be included in your flyer. A veterinary marketing flyer is a great tool for introducing a new veterinarian into your practice and to reinforce your brand. Flyers can stand alone or be easily inserted into your professional brochure. If done right, flyers can convey information to your clients about medical procedures, vaccine protocols, preventive care techniques, and recommended wellness services in a quick, memorable way. Start your brochure or flyer today by calling VetNetwork at 800-564-4125 or contacting us online. Interested in online communication with your clients? Successful options include veterinary email newsletters and veterinary hospital blogs.